We had a blast, you see, the previous three days... and while our weekend wedding in Graaff-Reinet's iconic Drostdy Hotel was everything we imagined, getting up super early on the Sunday morning to drive to Cape Town to jump on board our two-leg flight to Vietnam's Ho Chi Minh City was quite a stretch, to say the least. To make matters worse, my new husband was as sick as a dog. At regular intervals during our six-hour sprint from the Eastern Cape all the way to Cape Town International, we had to stop for him to... well... clear his throat. The cause of Louis' sudden illness was later known... one of our mates had thought it a good idea to mash up an entire packet of viagra and serve it to us dissolved in vodka. It was so fizzy we thought it was Berocca, so we - the both of us - guzzled it up thanking our 'thoughtful' friend for the boost of energy while we were dancing the night away. It was a miracle we made the flight, and that they allowed us on it even though Louis looked like a corpse. At the layover in Dubai, colour returned to his face and when the wheels hit tarmac in Ho Chi Minh City late the next night we were wide awake - so exploring we went! I might have been influenced by the whole wedding and all (or it was the viagra), but I fell in love with Vietnam from the moment we set foot in it. Ho Chi Minh, or Saigon as many locals still call it, is humid and noisy and busy. There's a continual buzz produced either by the sizzling street food or light rain drizzling on plastic sheets that cover the vendors' grills. A thick fog hangs over the city - a mix of the breath of the city's 8.5 million inhabitants and their 7.5 million motorbikes, and obviously, smoke from the fiery grills. It's food heaven. 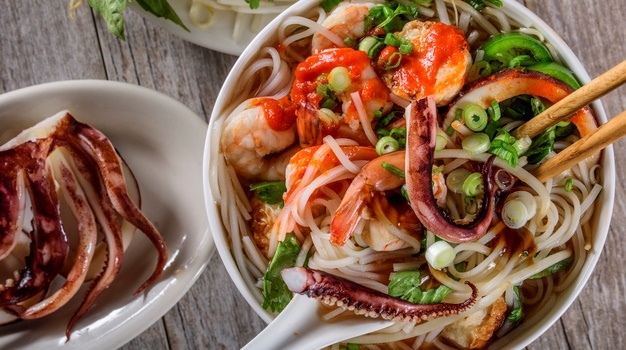 You can live in Saigon your whole life and not get 'round to tasting all the amazing foods there are. And it's because the spectrum of ingredients available there is just so vast - you'll see and taste fruits and veggies you never knew existed. They will blow your mind. And if you want, you can also try a wide array of proteins you never thought of as 'food'... cats and dogs, for example. We didn't venture there, but we explored Ho Chi Minh City in every other way imaginable. On our second day there, we made friends with local students who do voluntary tours through the city and zipped through the rain on the back of their motorbikes wearing blue, plastic rain jackets like everyone else. By the fourth or sixth day, when we had travelled on to the Hoi An Ancient Town and UNESCO World Heritage Centre, we were brave enough to take on the city on our own rented bike - pure bliss. While we really threw ourselves in to explore as much as possible of the local culture and food, and to get to know the people of Vietnam through the volunteer tours, we also splurged a little - specifically on accommodation. Staying in luxury made us even more open to throwing ourselves into adventure and exploring. Driving in the rain on the motorbikes or taking a stroll through the muddy rice paddies was all the better when we knew we could go back to a velvety bubble bath to regain our senses before the next day's adventures. Plus, you need that bubble bath... it's your honeymoon, after all. Both my husband and I are immense foodies - and for us, food is love. Hence, whenever we arrive at a new destination, we first eat our why through it before drawing any conclusions about our experience. After eating our why right through the country - from south to north - I can honestly say that Vietnam trumps Italy for food in my books. And, if you're after an express taste of the entire country, the Old Quarter in Hanoi is a good place to start. The markets are stunning and are open from the break of dawn when merchants come bearing their produce - balanced on bicycles. Live chickens and exotic birds (for consumption, yes), chirp and cluck in cages that hang from the sides of one bicycle while another lady balances an enormous basket of eggs of all sorts on the back of her bike. In the meats corner, pork, goat and beef are the main choices along with a small selection of river fish. You can buy the smaller animals either butchered or alive. The market is for restaurant owners and vendors, mostly, and you can't really purchase a meal there. I wouldn't recommend it either; there are too many little 'holes-in-the-wall' and restaurants to try out, anyways. Banh Cuon is a dish from Northern Vietnam, consisting of a thin, wide sheet of steamed fermented rice batter filled with a mixture of cooked seasoned ground pork, minced wood ear mushroom, and minced shallots. Bahn Cuon at 14 Pho Hang Ga street, as the name suggest, is a cafe dedicated to making this dish - and only that. And they've perfected it. The rice pancake is made right in front of your eyes - it really can't be fresher. The fillings are delicate and delicious and served, as per tradition, with fish sauce, chilies, fresh herbs and lime. Bánh mì is a Vietnamese stuffed baguette, an ode to the influence introduced by the French during its colonial period. The baguette is stuffed with all kinds of Vietnamese goodies - mostly pork, chilies, herbs and other yummy things. In Hanoi, we loved the little street food cart Bahn Mi 25, selling the best-tasting ones. Ice-coffee made with sweet condensed milk and the strongest brewed beans is also a must right-through Vietnam and in Hanoi too. Available at any coffee café. Then, the late night street food scene is just a thing of beauty in Hanoi. There are particular restaurants that only open during the night, and when they do they transform the entire feel of the Old Quarter to a massive mix of pubs, late night curio shops and the most delicious food. The must-eat at this time is the traditional barbecue, as they call it. At night, you'll find this available from a myriad of cafes and restaurants in what is called 'BBQ Alley'. Then, drinks at Bia Hoi Ha Noi is also a must. It might get a little touristy at times, but considering you only pay around R6 for a massive local draught at the spot makes it all the more worth it. Ha Long Bay UNESCO World Heritage Centre is perhaps Vietnam's most well-known attraction, and rightfully so. The fact that there are vertical mountains protruding from the ocean surface is otherworldly, and the fact that most of them are completely hollowed out underneath - making them appear to almost float on the water - is f-ing crazy. At some spots, the caves underneath the mountains allow you to row right through with a kayak - a trek that leads you to tiny ocean islands between mountains where rare white-headed langurs roam. Although Ha Long Bay is the most popular spot, it is very expensive. We opted to stay just a couple of kilos south in Lan Ha Bay, which provided an equally stunning experience at half the price, and with half the tourists. I can recommend giving local tour guide/operator Smiley a call. She will team you up with a local boat driver to take you anywhere your heart desires in the bay - to a private island, to kayak and snorkel (all gear provided), and to enjoy a meal at a local floating restaurant. This lesser known nook is referred to by locals as the inland 'Ha Long Bay', but that's not an accurate description. Let me tell you, this region of rivers and mountains is MUCH MORE beautiful than Ha Long Bay. At least, for us it was. The same concept of rowing through mountain caves apply, but here, your little wooden boat is rowed by a local - with her bare hands, and sometimes her feet! She steers you to ancient temples built in the isolated and dense mountain peaks, through dimly lit and very deep mountain caves. The Trang An Landscape Complex was also declared an UNESCO World Heritage Centre in 2014. In the harvest season, a trip will take you past the golden fields of rice. The latest King Kong movie was filmed in these mountains, the locals told us. We believed them, and I would have believed them if they told me that mythical creatures live in them too. It is one of the most beautiful and romantic places I have ever seen in my life. Hoi An Ancient Town and UNESCO World Heritage Centre is one of the oldest and most romantic cities in Vietnam. It's absolutely beautiful by day, and by night, it will blow your mind. The night market is where you want to be. Make sure you stay right in the heart of the city because you don't want to be struggling with parking and bikes. The Ancient Town's streets close for cars and bikes at dusk anyway, so your feet are your only option - but it's a blessing. You can't help but feel the 'love in the air' walking underneath those Chinese lantern-lit streets, eating some freshly fried banana pancakes or coconut ice-cream. The markets are also the place to buy some well-made Vietnamese souvenirs like dainty porcelain bowls or bamboo chopsticks. And, if you're looking for well-made clothing, shoes and accessories, Hoi An is also the best place to shop. The merchants are very affordable and make the clothes custom to your shape and taste. You can order a dress or shoes in the afternoon, and it will be ready for collection the very next day. 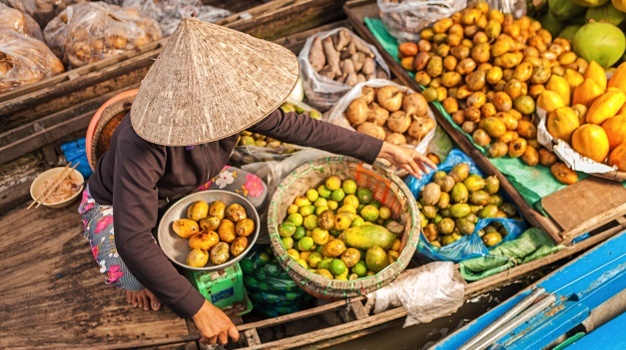 You know those iconic Vietnam photographs of people in boats with hats selling fresh vegetables - you'll find that in the Mekong Delta’s floating markets. But there's more to the Mekong Delta than markets. Whether you’re driving through the dragon fruit orchards or coasting along the otherworldly riverside coconut plantations, the Mekong Delta is one of the most romantic spots in Vietnam as it offers an authentic look into the country's produce and people. My recommendation is booking an overnight trip with Christina's OneTrip initiative in Ho Chi Minh City. They take you on an excursion, guided by a local, not only to see the markets but also to experience local traditions, like the making of rice paper by age-old recipes or how efficiently coconuts are used for making candies. This Airbnb success is what modern accommodation is all about - personalisation. Upon arrival, the team at Christina's had printed out a photo of Louis and I (which was posted to our Facebook) as a welcome card. They also made us the most delicious Vietnamese ice coffee on arrival, gave us a map and highlighted a few must-do experiences after asking what we were interested in. Their OneTrip tours are also some of the best, most authentic and affordable I've encountered. This is a superb spot from where to explore the bustling city, and the team at Christina's will really help you make the most of your trip. The best feature about Anantara in Hoi An is its location. It sits right on the river in the Ancient Town - the perfect vantage point from where to explore the city. We loved that they offer guests complimentary bicycles. In our room, the basket of exotic fruits was accompanied by a booklet to serve as guide to what you're eating - a must for us apple-and-pear-bound Westerners. Another highlight at Anantara Hoi An was how the local employees of the hotel took interest in our interests, and helped us choose experiences. We ate our way through Hoi An with the help of Duong, a local gal whose family happens to run a most-delicious Bánh mì stall close by. Doing a sunset cruise on the Thu Bon River is a must too. This is a stunning resort that overlooks several natural protected areas close to those stunning Ninh Bình mountains. What we loved most about our stay here - one of the most rural part of Vietnam - was the locals, again. Hotel manager Mrs Son, when Louis and I asked where would be the best place to have a local meal, invited us to her party at a restaurant close-by. We had such a blast, drinking shots of Vietnamese rice wine (I think), and eating platters of the freshest and most delicious Vietnamese fish, goat and pork (I think). The entire party, except for us, were Vietnamese, but they insisted on speaking tongue-twisting English for the entire evening to accommodate us. Traveller24 Insider TIP: Transport in Vietnam is very, very affordable. We tried the train, bus, flights and motorbikes - everything is super cheap. Flights cost around R400 per ticket and there are airports in even the smallest towns - that will give you the best access to explore the whole of Vietnam. Disclaimer: Traveller24 writer Louzel Lombard Steyn was hosted as media at Anantara Hoi An for part of her stay in Hoi An. - QUIZ: Where should you go on honeymoon?